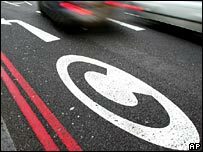 Capita is to be replaced as the administrator of London's congestion charge zone from 2009. Transport for London (TfL) announced that IBM had won the next five-year contract to run the system, beating two rival bids including one from Capita. TfL said the IBM bid had been chosen because it best met TfL's "operational and technical requirements". Capita said it was "disappointed" not to be chosen. Its current contract generates income of about £56m a year. The news hit Capita's share price, with the shares sinking more than 10% at one point. However, they later recovered to stand down 25p, or 3.4%, at 716p. The congestion charge was introduced to cover a zone in central London in 2003. The area covering the charge was expanded earlier this year. Apart from some exceptions, all vehicles entering the zone between 7am and 6pm, Monday to Friday have to pay an £8 fee. TfL also said that IBM would also administer the low emission zone from November 2009. The low emission zone - which begins in February 2008 - aims to deter the most polluting vehicles from being driven in central London by imposing charges on lorries, coaches and buses that fail to meet low emission standards.